Students exercise at a weight-loss summer camp in China’s Shandong Province. 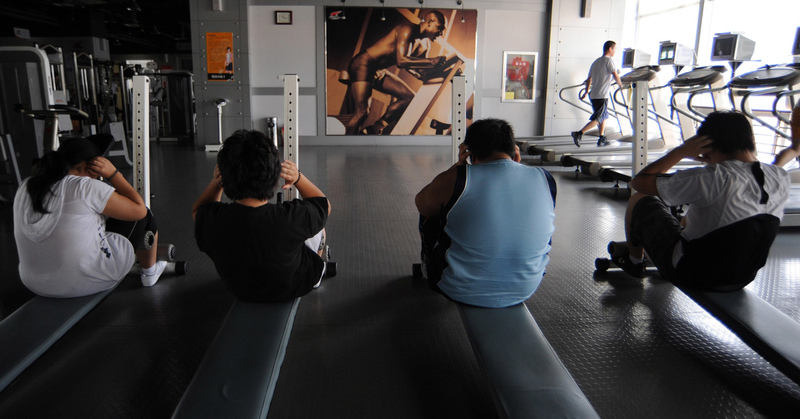 The government promotes physical activity as the solution to a growing obesity problem. The Coca-Cola company exerted strong influence over the way the Chinese government addressed the country’s growing obesity problem, according to a study published Wednesday in the Journal of Public Health Policy and the BMJ. Study author Susan Greenhalgh, a social scientist and China scholar, wanted to uncover the opaque process of science-based policymaking in China. She focused on the government’s efforts to address a growing obesity crisis: The percentage of obese Chinese adults more than doubled over two decades, from 20.5 percent in 1991 to 42.3 percent in 2011. Greenhalgh’s years-long investigation unraveled the complex personal, institutional and financial connections the soda company cultivated to align Chinese science and policy with the interest in building a market for Coke in China. Worldwide obesity rates have tripled from 13 percent in 1975 to 39 percent in 2016. The trend has drawn the attention of public health officials. In the late ’90s and early 2000s, a consensus emerged in the public health community that beverages loaded with added sugar, such as soda, are partly to blame. To curb consumption of these drinks, countries have issued public health messages and enacted policies such as soda taxes. As a result, soda consumption is on the decline in many Western countries. That’s bad news for soda giants, who want to grow their market. A series of reports from The New York Times in 2015 detailed how, in the U.S., Coca-Cola has tried to downplay the role of diet while supporting and amplifying research that emphasizes the importance of physical activity to bring down obesity rates. Whether their influence extended beyond Western countries into emerging markets such as China was unclear until Greenhalgh’s investigation. Western support in science was especially valued because up until recently, “the Chinese have had this narrative of national scientific backwardness,” Greenhalgh said. Many welcomed support from this Western organization. Under Chen’s leadership, ILSI-China would come to be the primary entity shaping Chinese obesity science and policy. Greenhalgh learned that this influence began when ILSI-China, at the government’s request, drafted guidelines for the prevention and control of obesity. These were published in 2003 as official national policies, but without any indication they were created by the Coke-backed entity. “This firmly established ILSI-China as the key obesity-related science and policymaking organization,” Greenhalgh said. ILSI-China was well-positioned to align Chinese obesity science and policy with Coca-Cola’s emphasis on a lack of physical activity, as opposed to diet, as the major cause of obesity. Coca-Cola put its full weight behind this message as public health entities such as the World Health Organization began to draw attention to the obesity epidemic. According to Greenhalgh, Coca-Cola crafted ideas such as “Energy Balance” and “Exercise is Medicine” to construct a narrative that all foods (including Coca-Cola) are part of a healthy diet as long as they’re balanced with physical activity. Coca-Cola’s influence is perhaps most clear in Chinese public policy initiatives. ILSI-Global set up a Center for Health Promotion in Atlanta aimed partly at promoting physical activity solutions to the obesity crisis. According to Greenhalgh, Malaspina played a key role in organizing this center, and Chen was one of its board members. In 2004 the center unveiled Take 10, a 10-minute kid exercise program promoted by Coca-Cola. Greenhalgh found that shortly afterward, ILSI-Global transferred just more than $50,000 to the Chinese Centers for Disease Control and by the end of the year the organization had rolled out its own childhood obesity program called Happy 10. Since The Times’ 2015 investigative reporting, Coca-Cola has backed off its advocacy of its ideas about obesity in China. In response to Greenhalgh’s study, the company released a statement acknowledging that “too much sugar isn’t good for anyone” and emphasizing a move toward more transparency in research funding, plus a pledge to not be the main funding source for any research. They also said they have expanded their no-sugar and low-sugar options in China. Despite this shift, Coca-Cola’s imprint on Chinese obesity policy remains palpable. For example, Greenhalgh analyzed public policy documents related to Healthy China 2030, a Chinese initiative unveiled in 2016 to address chronic disease. She found that most of the specific targets of the initiative relate to increasing physical activity and that goals surrounding nutrition are restricted to limiting salt intake. Further, Coke-backed terms such as “energy balance,” “eating and moving in balance” and “exercise is medicine” are featured prominently in those documents. “That’s really shocking because that’s the language Coke’s been promoting all along,” Greenhalgh said. Jonathan Lambert is an intern on NPR’s Science Desk. What's the Deal with Probiotics and Which Ones Should I Take?